In the eyes of the snobbish, close-knit Austrian monarchy and aristocracy, it was the wedding that should have never happened. In fact, based on the embarrassingly small party who watched the heir to the Hapsburg throne marry a Bohemian lady-in-waiting, it simply did not happen. Nevertheless, Archduke Franz Ferdinand defied his rank, his family, and his social circle to marry the woman he loved, and the fourteen years of marriage he and Duchess Sophie were permitted further defied the unspoken edict against finding love outside of a dynastic match. Franz Ferdinand’s life changed drastically when Crown Prince Rudolf committed suicide at Mayerling in 1889. Prior to that, he was simply the eldest son of the younger brother of Emperor Franz Joseph and the ill-fated Archduke Maximilian, the short-lived Emperor of Mexico. His father, Archduke Karl Ludwig, quickly renounced his succession rights, leaving Franz Ferdinand, then a twenty-six year old army captain, as heir presumptive to the Austro-Hungarian throne. From then on, Franz Ferdinand’s life was highly regulated as he was groomed to rule a nation comprised of almost a dozen ethnicities–who spoke just as many languages–spread across a territory of 239,977 square miles. He was also considered a very eligible bachelor, though the very, very strict and suffocating laws that ruled the Hapsburg monarchy only considered members of one of the reigning or formerly reigning dynasties of Europe as an eligible marriage partner. Countess Sophie Chotek, a Bohemian (Czech) aristocrat, was definitely ineligible. Sophie, though a member of a prominent Bohemian aristocratic family whose ancestry included some royal lineage from the female line, was very much below the Archduke in rank and importance, and actually served as lady-in-waiting to one of the Hapsburg relations. It was in this capacity that she and Franz Ferdinand met and fell in love, whereupon they conducted a secret courtship through letters for two years. He managed to meet with Sophie under the guise of visiting her employers, the Archduke Friedrich and Archduchess Isabella, but unfortunately, the Archduchess assumed he’d fallen in love with one of her daughters. When his true motives were discovered, scandal broke out in the house of Hapsburg. Sophie was immediately dismissed from her position in the Archduchess’s house, which forced Franz Ferdinand to openly declare his love and his intentions to marry her and no other woman. The Emperor and the Imperial family were furious, but Pope Leo XIII, Tsar Nicholas II of Russia, and the German Emperor Wilhelm II all interceded on Franz Ferdinand’s behalf. Franz Josef, faced with the double humiliation of his heir falling for a lady-in-waiting and his fellow monarchs taking him to task, finally consented to the alliance–but on one condition. 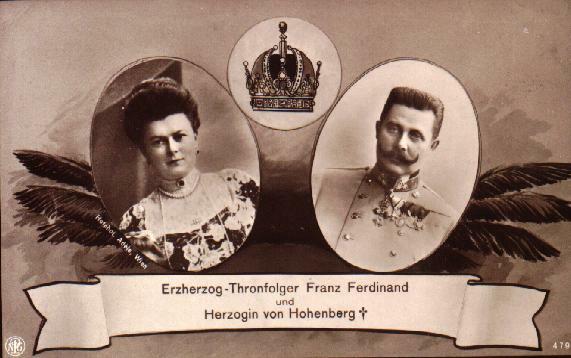 Franz Ferdinand had to agree to a morganatic marriage and renounce the claim to the throne for any children he had with Sophie. Sophie would not share her husband’s rank, title, or precedence, which in the strict Hapsburg etiquette, forced her to enter rooms behind every Archduchess, even if she were but a child. 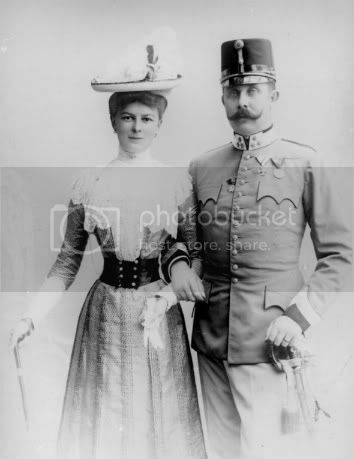 After all of the furor surrounding their clandestine romance and the fight to marry, Sophie and Franz Ferdinand were wed on July 1, 1900, at Reichstadt in Bohemia, with only his stepmother and step-sisters as witnesses. It was a wedding ceremony starkly unlike one he would have received had he married a woman of his rank. The Emperor raised Sophie to Princess of Hohenberg, with the style Her Serene Highness, which helped a little, but not much. Because of the snubbing of his wife, and the friction his choice of bride created between he and his uncle, the Emperor, Franz Ferdinand and Sophie created their own family life together with their three children. Though we all know of the tragic ending of their lives one fateful day in June of 1914, the marriage of Archduke Franz Ferdinand and Countess Sophie Chotek was both romantic and pragmatic, for the heir to the throne renounced the typical dynastic marriage for love. Thus ends me Royal Wedding series! How many of you stayed up late (or woke early) to see the wedding of Prince William and Kate Middleton (now, the Duke and Duchess of Cambridge)? Anyone throw a royal wedding party? What were your favorite parts? 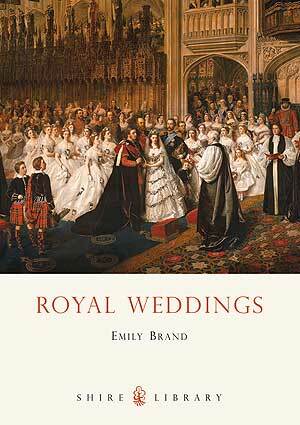 Leave your responses below to be entered into the drawing for Royal Weddings by Emily Brand! 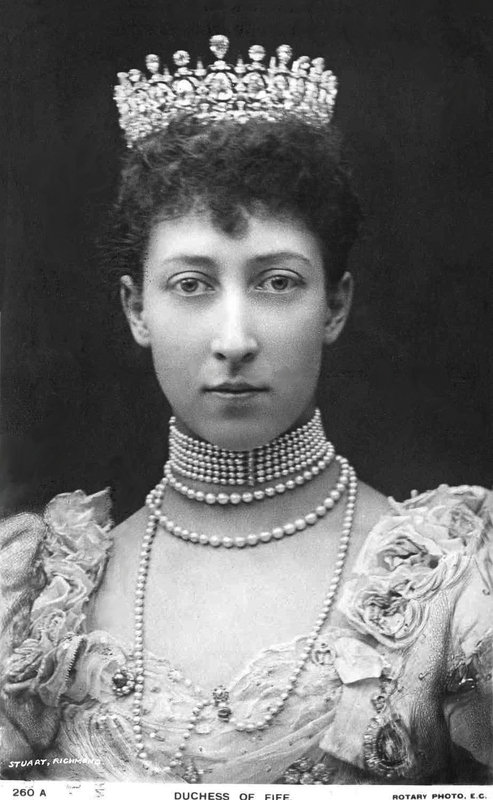 According to Royal Magazin, these jewels included “a brooch in roses, thistles, and shamrocks in pearls and diamonds, set in gold” from the Duchess of Teck, “a large pearl with a small diamond fly perched upon it. Its head is a sapphire, and its eyes are diamonds” from Prince and Princess Christian (her aunt Helena), “a beautiful diamond spray (divisible into three brooches, in a design of forget-me-nots and leaves the blossoms being of the very largest size to which the flower ever grows)” from – Mr Farquhar (Lord Fife’s best man), “a pendant, in which an uncut cabochon ruby is surrounded by brilliants cut in the old tabular fashion, a wonderful pink stone set with large diamonds. It may be a cabochon ruby, but it is possible that it is a much rarer stone, a pink sapphire” from the Duke and Duchess of Westminster, and “a bangle of pearls, with a border of diamonds” from the Marquess and Marchioness of Londonderry. Read a greater list of the Princess Royal’s wedding jewels here. 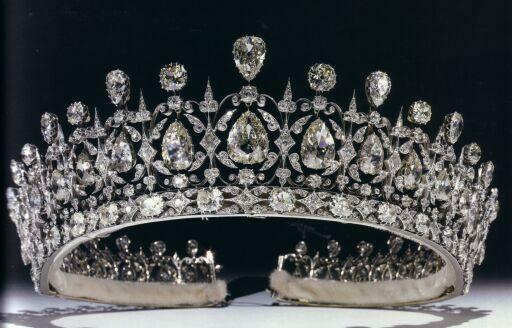 The crown jewel of the collection was the magnificent tiara presented to Princess Louise, the Princess Royal, by her husband-to-be, the Earl of Fife (his title was raised to that of Duke by Queen Victoria). Speculation about Kate Middleton’s dress is rampant, but some haven’t forgotten to wonder which tiara she will wear, and according to the The Telegraph, there is a £72,000 bet placed on Kate wearing the Queen’s tiara, which has been worn by Queen Victoria, Queen Mary, Queen Elizabeth, the Queen Mother, and Princess Anne, the Princess Royal. In the meantime, Hello! Magazine has created a slideshow of the many sumptuous and brilliant tiaras possibly at Kate’s disposal. Oddly enough, there was at least one royal wedding of the late 19th and early 20th centuries which did not involve a relative or descendant of Queen Victoria! 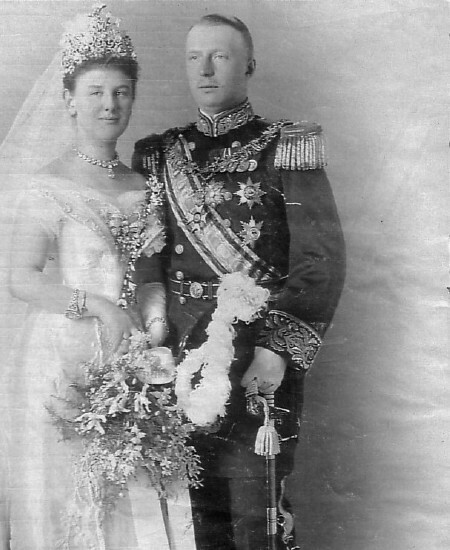 Another note of interest was that this wedding was of Europe’s only other reigning Queen and that her marriage to rather minor German noble also raised a similar fear of “Germanification” of her country. Wilhelmina came to the throne under a series of unfortunate events. The Dutch monarchy existed under a Semi-Salic law, which meant that “firstly all male descendance is applied, including all collateral male lines; but if all agnates become extinct, then the closest heiress (such as a daughter) of the last male holder of the property inherits, and after her, her own male heirs according to the Salic order.” By the age of four, all of Wilhelmina’s brothers and other male relations had died, placing her second in line. Her father, King William III, died when Wilhelmina was 10, and she ascended as Queen of the Netherlands, though her mother, Queen Emma, was named regent. The young queen was well-liked by her subjects despite the very democratic Dutch system of government, and Wilhelmina even won the favor of the highly critical Queen Victoria when she visited England in 1895. The young Queen … still has her hair hanging loose. She is slender and graceful, and makes an impression as a very intelligent and very cute girl. She speaks good English and knows how to behave with charming manners.